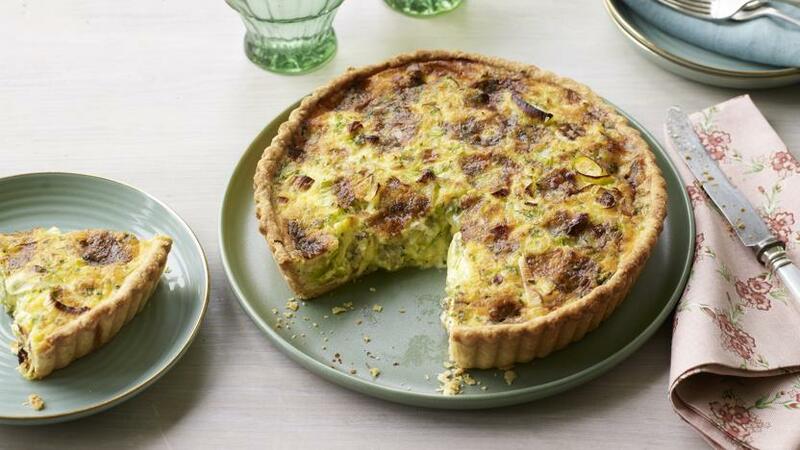 Trust Mary Berry's leek and Stilton quiche recipe for a picnic or buffet. It's as reliable as she is. You will need a 28cm/11in loose-bottomed, deep quiche tin – ideally fluted. To make the pastry, measure the flour and butter into a food processor and blend until the mixture resembles breadcrumbs. Add the egg and water and blend again until it forms a smooth dough ball. Roll on a lightly floured work surface and use the pastry to line a 28cm/11in loose-bottomed, deep quiche tin. Form a little lip around the top and prick the base with a fork. Place in the fridge for 15 minutes. Line with baking paper and baking beans and bake for 15 minutes. Remove the beans and paper and return to the oven for a further 5–10 minutes, or until just cooked and pale golden-brown. Reduce the oven temperature to 180C/160 Fan/Gas 4. To make the filling, heat the oil in a wide-based frying pan, add leeks and celery and fry over a high heat for few minutes. Lower the heat, cover and simmer for about 25 minutes, or until the vegetables are completely tender. Remove the lid, increase the heat and fry for a minute to cook off any excess water. Beat the eggs and cream together in a jug and season with salt and pepper. Spoon the soft leeks and celery into the pastry case, scatter with cheese and parsley and season with salt and pepper. Pour over the cream. Bake for about 35–40 minutes, or until golden-brown and just set on top. Leave to sit for about 5–10 minutes before turning out. This can be made up to 8 hours ahead and reheated or frozen – the pastry base can be cooked and frozen ahead.